Hello, hello! I hope everyone is doing well. I don’t know about you, but I just can’t wait for the next couple of weeks to fly by. I’m just itching for summer like crazy and am jealous of all of those who are already on their break. Anyhow, since I still in these final stressful weeks of school, I’m going to make this a quick one, so let’s get started! 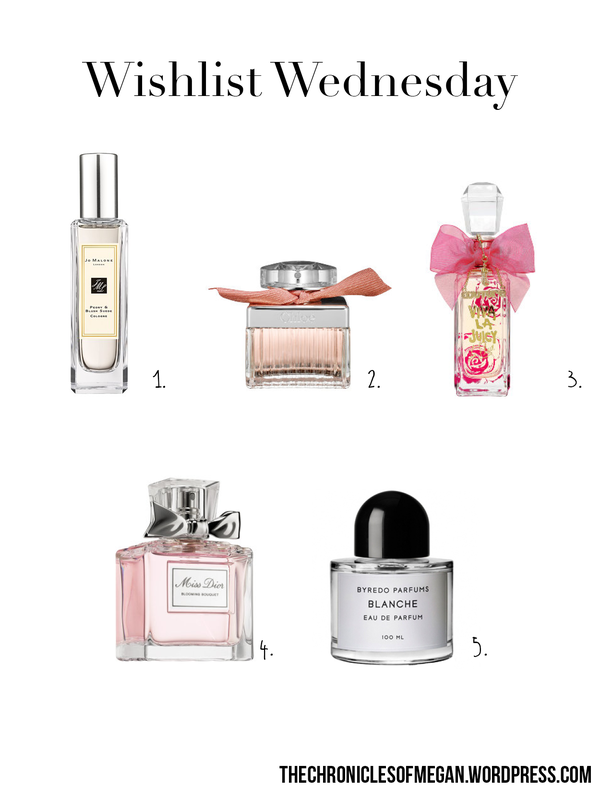 This week, here’s a few pick for floral fragrances I would like to explore. I adore floral fragrances and find that they are a super versatile scent that can be mixed with any assortment of undernotes to create any signature fragrance you can desire. Roses and vanilla for romance, Passion Flower and fruity smells for fun, or White flowers and greens for freshness, the combinations are endless and there is a floral scent for practically anyone. With the warmer months ahead, the light notes make these perfumes the perfect signature fragrances for summer! Jo Malone Peony and Blush Suede– This cologne has been on my wishlist for a few years now and I can’t walk by a Jo Malone counter without giving this a whiff. It’s an absolutely gorgeous scent that is a classic floral fragrance, reminiscent of a fresh bouquet, with a touch of warmth. Notes include Peonies, Red Apple, Jasmine, Rose and Gillyflower. Chloé Roses de Chloé– I have so many samples of this scent it’s not even funny. This is the sister scent to the original Chloé perfume which I featured in my Mother’s Day Gift Guide, last month. This fragrance smells of pure roses. It’s the perfect feminie and dainty, delicate scent. The notes are Fresh Cut Roses, Bergamot, Rose Essence, Magnolia Accord, White Musk, Amber. Juicy Couture Viva La Juicy La Fleur– I have the original Viva La Juicy scent which a super youthful and fruity fragrance. This is it’s slightly more refined cousin, with notes of Wild Berries, Mandarin, Honeysuckle, Gardenia Petals, Soft Jasmine, Vanilla, Caramel, Sandalwood. There is still a good amount of fruit scent, with just the right amount of touches of florals to make this easy to wear, and not overwhelmingly granny-ish. Miss Dior Blooming Bouquet– This fragrance is a play off of the original Miss Dior scent. It is a slightly citrusy and lightly musky scent, perfect for both day and night, making it he perfect chic and elegant fragrance option. The notes include Sicilian Orange Essence, Pink Peony, Damascus Rose, White Musks. Byredo Blanche Eau de Parfum– This is the most unique floral perfume of the bunch, with heavy notes focused on musk and spice. This fragrance is very modern and sultry. The notes for this fragrance are White Rose, Pink Pepper, Aldehyde, Violet, Neroli, Peony, Blonde Woods Sandalwood, Musk. Ok, that’s it for now! 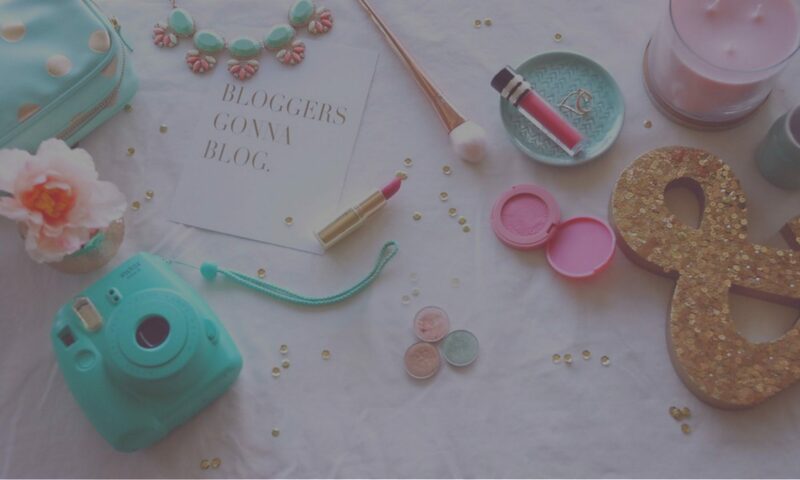 Stay tuned til the end of the week for a fun post, coming your way!